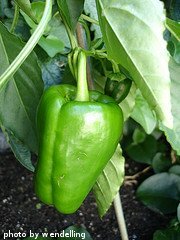 Some backyard gardeners start growing peppers with pepper seeds. Others start with seedlings. You can be successful with either method. Here are some thoughts that might help you make up your mind. Peppers are generally planted in the garden using transplants. This is true for both traditional and container vegetable gardens. A transplant is a seedling plant that is grown from seed in a small container. That plant is then transplanted from the small container into your garden. Seeds and seedlings can be purchased at your local garden shop or home improvement store. In most cases, pepper plants will not grow successfully if the seed is sowed directly in the garden. If you choose to purchase seeds and grow your own seedlings, there are several things to be considered. 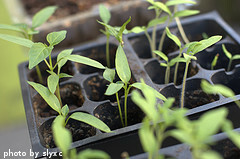 It will take 6-8 weeks to grow seedlings from seeds. With this in mind, you'll want to start growing your seedlings approximately 2 months before you plan to transplant them into your garden. Most people who choose to start with seeds do so because of the number of varieties of peppers available. The average retail store might carry 2-3 varieties of sweet pepper seedlings and 6-8 varieties of hot pepper seedlings. If you grow sweet and/or hot peppers from seed, there are hundreds of varieties to choose from. This is especially appealing to all the "chili heads" out there who like to try different and exotic types of hot peppers. Another advantage to growing peppers from seed is that you control how the seedling is fertilized and cared for. This is especially valuable if you intend on growing truly organic peppers. If you choose to start with seeds, it will require more effort. You'll need to purchase additional supplies such as flats, small containers and potting soil. You'll have to plant the seeds in flats, water them, transplant them into small containers, etc... Additionally, you'll need a suitable indoor space to grow the seedlings. This should be a warm space that gets plenty of sunshine. Many backyard gardeners don't want to deal with the extra effort and mess of starting with seeds. For many people, it's more convenient to purchase pepper seedlings. If you love gardening and want a great place to start seeds, please visit our friends over at Solar Gem Greenhouses. They have some great products that are perfect for seed starting and extending your growing season. If you have weighed the options and decide to grow peppers from seed, here are the steps you need to take. First, head to your local retail store and purchase the seeds you want to grow. You can also purchase seeds from online retailers. Be sure that the seeds you want to buy will grow in your geographic area. You'll also need to purchase flats (plastic trays that have several, very small planting containers attached to each other), potting soil or top soil, and small, pint-sized containers. These containers should have holes in the bottom that allow excess water to drain out. Plastic, disposable picnic cups work well as small containers. Just remember to poke holes in the bottom for drainage. Once you have these supplies, you're ready to start planting the seeds. Fill the flats with potting soil, leaving 1/4 inch at the top. Put 2-3 seeds in each container and cover with potting soil. Water the flats until the soil is good and moist. Place the flats in a warm, sunny location. Continue to water every few days, making sure the soil stays moist, but not waterlogged. Once the seedlings reach 1 inch tall, thin to 1 plant per container in the flat. When the seedlings reach 2 inches tall, it's time to transplant them into the pint-sized containers. Place 1 1/2 inches of potting soil in the bottom of the small containers. Carefully remove a pepper seedling (roots and soil too) from the flat and place it in the container. Fill the remaining space with potting soil, going to the top of the root ball. Water the plants thoroughly. Leave the containers in a warm, sunny location. When the seedlings are 4-5 inches tall, they are ready to be transplanted into your garden.If you choose to purchase pepper seedlings, it's important to buy the best seedlings available. Choose seedlings that aren't wilted and that have moist soil. Avoid those plants that have spots on the leaves or stems. Make sure there is only one seedling per container and that there are plenty of leaves on the plant. The seedlings you choose should be 4-5 inches tall. If you don't see any seedlings that look good to you, ask a store employee when they will be getting in another shipment of plants. The sooner you are able to arrive at the store after the shipment arrives and is put on display, the better your chances of finding good, strong pepper seedlings. You can also choose to purchase smaller seedlings that are growing in flats. These are generally more inexpensive than individual container seedlings. Sometimes you'll want to transplant these small seedlings into small containers before transplanting them into your garden. 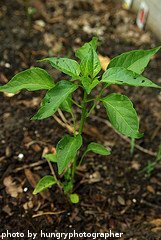 A pepper seedling that is 4-5 inches tall when transplanted into the garden will have a higher success rate than smaller seedlings. Larger seedlings will generally yield higher quantities and quality of fruit. However, we've also had success transplanting seedlings from flats directly into our garden. Once you have seedlings that are 4-5 inches tall, it's time to plant them in your garden.